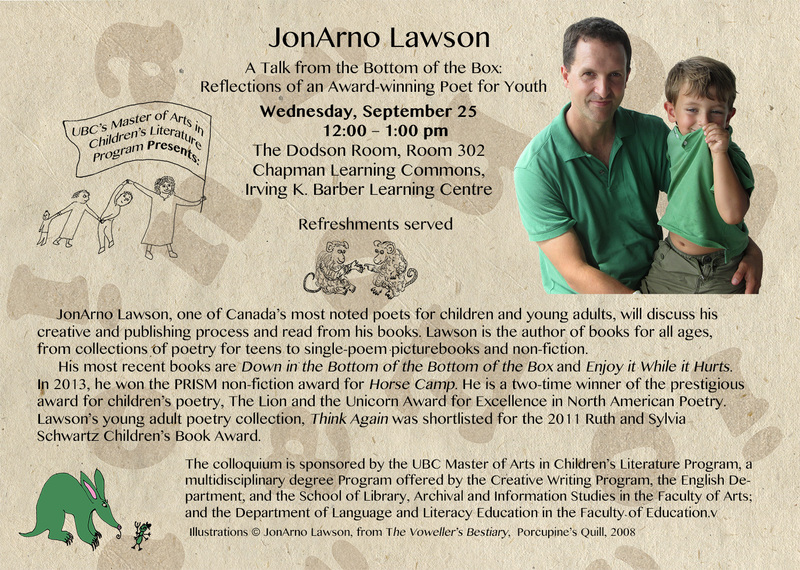 JonArno Lawson, one of Canada’s most noted poets for children and young adults, will discuss his creative and publishing process and read from his books. Lawson is the author of books for all ages, from collections of poetry for teens to single-poem picture books and non-fiction. His most recent books are Down in the Bottom of the Bottom of the Box and Enjoy it While it Hurts. In 2013 he won the PRISM non-fiction award for a piece he wrote called Horse Camp. Lawson’s young adult poetry collection, Think Again was shortlisted for the 2011 Ruth and Sylvia Schwartz Children’s Book Award. Lawson has taught children’s poetry in the Master of Arts in Children’s Literature Program at Simmons College, Boston, and gives workshops for children and adults. The colloquium is sponsored by the UBC Master of Arts in Children’s Literature Program, a multidisciplinary degree Program offered by the Creative Writing Program, the English Department, and the School of Library, Archival and Information Studies in the Faculty of Arts; and the Department of Language and Literacy Education in the Faculty of Education.